To me, it’s just amazing all that is in the Bible; and all that we miss no matter how many times we hear a story; something new comes out every time- because it is His timeless Living Word. (Be honest, you couldn’t make this stuff up with these details, to never contradict and be so consistent, through 40 men’s telling over 1500 years, on three continents in at least three languages… Come on!) There is just too much in there to doubt. Side note- if you know of a paying job that requires me to research Bible topics, stories, verses, characters, etc., please let me know! How awesome would that be!?!? Until then- anyone want to meet for coffee and discuss some ‘hot topics’ that I need to dig into? The next scene with Moses takes place 40 years later (Moses is now 80) These years weren’t spent waiting or wasted; God knows what we need and when we are ready; (trust God’s timing in humility and faith) these were some of the most important years in Moses’ life—he learned hard work, humility and empathy for others; he lost his pride. His faith had been misplaced in ‘self’ at the beginning, showing he never really trusted God entirely in the first place. He then questioned his and His authority. (Exodus 3:13-15) “I am that I am” (Yahweh): God is completely independent and relies on nothing and no one for existence because there was never a time He was not, nor a time He will not be, because God is “The One Who Becomes” whatever is lacking in our time of need. Jesus repeatedly used this Name for Himself, identifying Himself as God. (John 8:57-29, John 13:19) Moses still argued that the Israelites wouldn’t believe him. (Exodus 4:1) God promised him they would. Moses went on to argue (find excuses) of why he shouldn’t be the one—still focused on himself. (Exodus 4:10-11) After Moses’ heart was revealed as lacking faith God shows His displeasure with him. (Exodus 4:12-17) Lesson: stop doubting His ability to use you (you’re really just doubting God- not yourself) and stop belittling others that are created differently (you’re belittling God). Moses finally agrees to go, but only if God sends Aaron along. Imagine how Moses must have felt stepping back into the palace that was his home, as an old common shepherd; he must have felt intimidated, humiliated and scared. But when he showed faith and strength to finally tell Pharaoh to release the Israelites: Exodus 5:1-2, 20-23. First, note that when Moses followed God in faith, things didn’t get instantly better, they got worse. Lesson: many people feel they are serving God as they should be and immediately doubt God or themselves when things don’t go right in their lives, or when things are taking longer than they ‘should’, and they give up on God. God sees so many aspects of the big picture that we can’t see, and the time our faith is truly tested is when what we see does not seem to support what God is supposed to be doing. Moses continued to follow God in faith, even when things didn’t go well, and that’s when God moved. 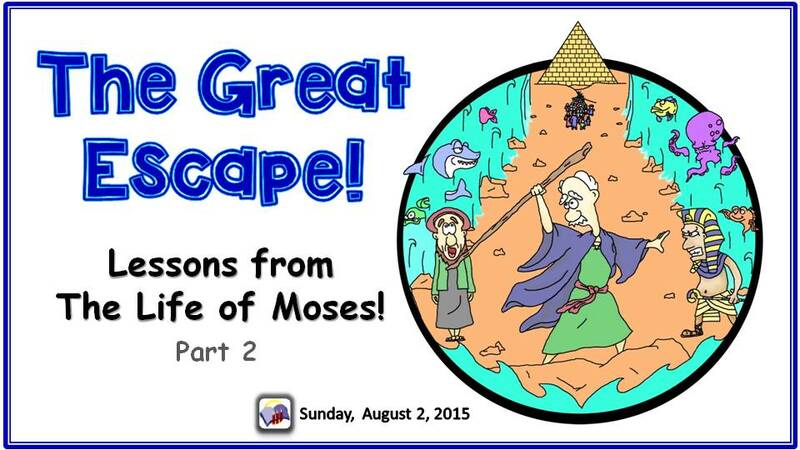 Next, Pharaoh challenged Moses that his God wasn’t real and the Egyptian gods were real. (Exodus 5:2) This is why God used something as strange as the plagues to prove Himself to the Egyptians and the Israelites. Each plague was a show of power/sovereignty over a false Egyptian God. The fact that the plague could happen at all, on command, was proof that the Egyptian gods were powerless to stop Yahweh. 1) Nile River to blood- killing millions of fish, made unusable; against Hapi (the god of the Nile) and Osiris (crop fertility goddess) to whom the Nile served as a bloodstream. The Nile was a religious center of life and supported the whole national economy. 2) Frogs across land- invading every part of home and social life; against Heqet (frog-headed goddess of birth); frogs were sacred and could not be killed. 3) Gnats everywhere- magicians could not duplicate this one; against Set (god of the desert from whence the gnats came); magicians finally begin to claim it was God. 4) Flies everywhere- distinguishes between Egyptians and Israelites against Uatchit (the fly god). 5) Death of livestock- destroying the economy of Egypt slowly, while differentiating them from Israelites again; against Hathor and Apis (goddess’ depicted as cattle) 6) Boils- magicians couldn’t stand before Moses; against Sekhmet, Sunu & Isis (of health and disease); Israelites not effected. Pause here for Pharaoh to be warned that these next plagues would be worse, and told to bring in slaves, cattle and crops or they’d be destroyed. 7) Hail storm, accompanied by fire- caused by lighting; against Nut (sky goddess), Osiris (crop fertility goddess), Set (storm god); didn’t affect Israelites; killed livestock, slaves and destroyed crops (flax & barley). 8) Locusts- ate the remaining crops of wheat and rye—no harvest at all for Egypt now (economy destroyed) against Nut, Osiris and Set again. 9) Darkness- unnatural darkness that could be felt; so dark, everyone was scared to move for 3 days; Israel had light; against Ra (god Pharaoh symbolized). Pharaoh told him not to show his face again or he’d die. 10) Death of every firstborn male child and animal by Destroyer (Angel from God); against Isis (protector of children). Passover occurred on this night (this was so important that the Israelites were told to change their calendars forever- making this the first month of the year now). Israelites were only exempt from this plague if they conditionally sacrificed a Lamb and spread the blood on the doorposts. (Jesus was crucified on the eve of Passover 1400 years later as the lambs were to be killed for the meal) (Daniel 9). These plagues crippled Egypt and was proof of Moses’ God that Pharaoh relent and let them go. As the Israelites rushed out into the night, they received gold, silver, jewelry and clothes from Egyptians (loaded with treasures). Copyright © 2015 Word of Light Community Church, All rights reserved.